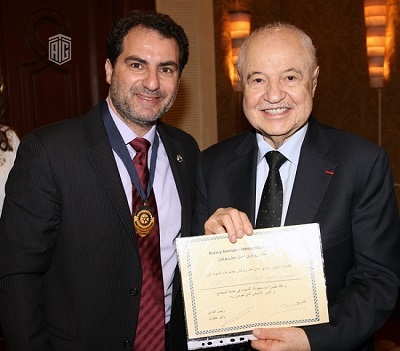 AMMAN - The Rotary Club of Amman ‘Ammon’, in collaboration with other Rotary Clubs in Jordan, hosted HE Dr. Talal Abu-Ghazaleh as a keynote speaker during its monthly meeting held at Landmark Hotel in Amman. 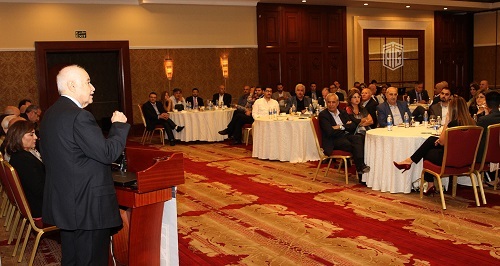 In his speech, Dr. Abu-Ghazaleh, founder and chairman of Talal Abu-Ghazaleh Organization (TAG-Org), stressed the significance of transforming communities into digital knowledge-based societies, noting that shaping the future will not be achieved without Information Technology and the introduction of digital production in various fields. He added that today, the world embraces the beginning of the Fourth Industrial Revolution or so-called ‘Digital Knowledge Revolution’, affirming that in this phase the boundaries between physical, digital and biological worlds will be twisting with the ermergence of unprecednted technologies. Dr. Abu-Ghazaleh also underscored the need for changing the method of education in Jordan instead of developing it, saying “the only way to make wealth in the future is through creative and innovative education,” highlighting at the same time the importance of the Knowledge Product’ stating that world giant corporations are knowledge-creating companies. Based on international studies and reports, Dr. Abu-Ghazaleh predicts that the US economy will face a financial crisis which will transform into a global economic global crisis; as it’s expected that oil prices will increase to hit more than $100 a barrel in 2020 that might lead to international turmoil and could eventually trigger a war. According to Dr. Abu-Ghazaleh, leaders of the great powers would gather to avoid such a war or might gather after it has been erupted to reach new international agreements that could be as important as the Bretton Woods agreements. Furthermore, Dr. Abu-Ghazaleh pointed out that the Arab region can be the only beneficiary among other countries in the world for reasons attributed to its position and the interests of great powers. 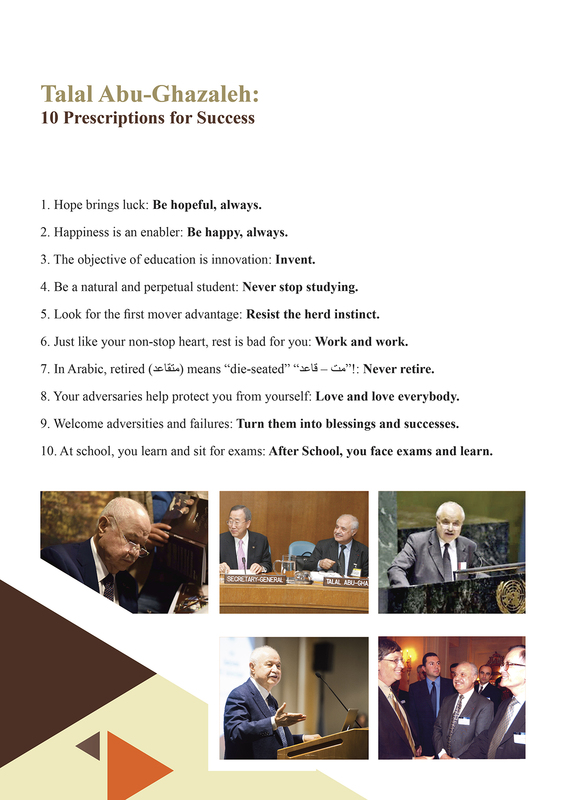 However, Dr. Abu-Ghazaleh believes that this opportunity can be maximized by building knowledge societies in which women will have the key role by raising digital children (from the age of two years old) and encouraging them to live in a digital cyber world without giving attention to the clichés about Internet Addiction, welcoming such an addiction if it is an addiction to knowledge, creativity and welfare. 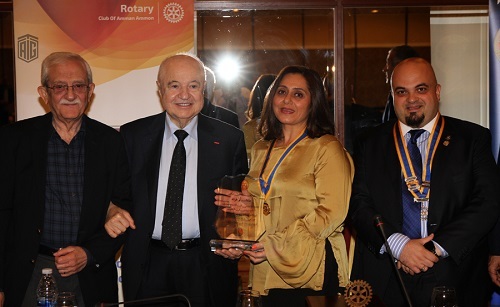 At the end of the meeting, Dr. Abu-Ghazaleh expressed his gratitude and appreciation to the Rotary Clubs for hosting him and for their contributions to social development and their support to disadvantaged communities. 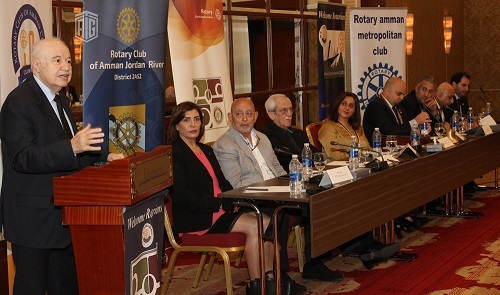 It is noteworthy to mention that members of Rotary Clubs in Jordan, including hundreds of men and women, work in various professional fields and sectors and offer volunteer work to help their societies through development programs. They also provide educational and practical capacities to improve the lives of disadvanaged individuals and promote hope in less fortunate areas. It’s worthy to add that Jordan currently has 13 Rotary clubs which contribute to serving local society by implementing various projects that help alleviate poverty, secure drinking water for students, promote peace and fight illiteracy, promote health and education, in addition to executing enviromental projects and initiatives which focus on humanitarian aspects.